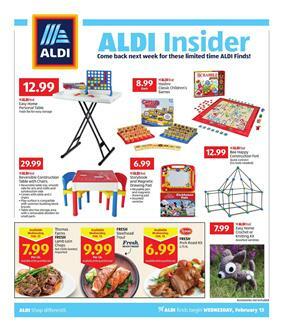 Entertainment products like board games, educational toys for kids, and more are available in the new Aldi Weekly Ad. Hasbro classic children's games, Bee Happy construction fort, storybook, and magnetic drawing pad, and more products are the featured items on the first page. Kitchen appliances like Crofton products and other kitchenware items are available on pg 2 of the ad. Upgrade the tools, improve the systems of your kitchen for more precise results in cooking. Find protein water, healthy foods, simple meals on pg 3. Aldifind deals on these products will result in only more profitable shopping for everybody who likes to shop at Aldi stores. Browse the final page for bathroom products like mesh organizer, toilet tissue holder, power toothbrush etc. Aldi's latest ad offers an alternative shopping idea for everybody. 4 pages full of good deals.